Oh, I wish I were a better student. Here are the things I need to do before I take my Instrument Rating check ride with an FAA examiner, and my progress on them as of March 17 2006. I’m using a set of DVDs from the King School of Aviation. I’m fifteen percent of the way through them. As soon as I finish I take a bunch of mock exams on the computer and then go take the real thing. It’s painful so far. Cross-country flights are more than fifty nautical miles. Because I fly often to Las Vegas I already have over sixty-six hours. So this one is taken care of. Right. That’s ten hours of cross-country flying in the same aircraft type that I will be doing my instrument training in. I have already flown nearly forty hours cross-country in my chosen platform (the DiamondStar DA40). I can’t believe this requirement. I mean, it just seems impossible. We flew to Las Vegas yesterday. It’s a two hour flight. The night before I was falling asleep and I thought, “I am going to stay under the hood for ninety minutes…” After fifteen minutes under the hood, climbing out over the San Fernando Valley I thought, “I can’t believe it’s only been fifteen minutes. Okay, I have to make a full hour…” I believe that some portion of this can be simulator time, but it still seems like a lot of time. I’m flying about sixteen hours a month and that would mean three months of flying entirely under the hood. Or maybe I just have to do a week, nine-to-five. I could just crisscross the country. I have seven hours. Seven. This is similar to the cross-country requirement for getting my private pilot certificate. I assume “IFR” means that I have to file an IFR flight plan and fly some portion of it under the hood, making ILS approaches at the destination airports. This will be easy and as soon as Adam and I have a coherent syllabus we’ll knock this one out on a couple Vegas trips. I did over fifty hours of dual time (that’s flying with the instructor next to you) for my private pilot. Fifteen is going to be a breeze. The hard part is going to be selecting an instructor. Easy. 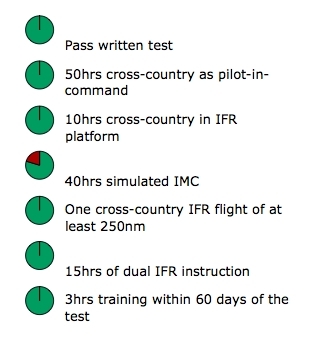 I plan to do the fifteen hours of training within two months of the test.